Magazine Troubles, Yes, But What's the Story? Yesterday's Times ran a story on the Arts page - something of a lead story - that struck me as oddly reported and unfinished, and it bothered me quite a bit that they'd even run it. Where was the story? 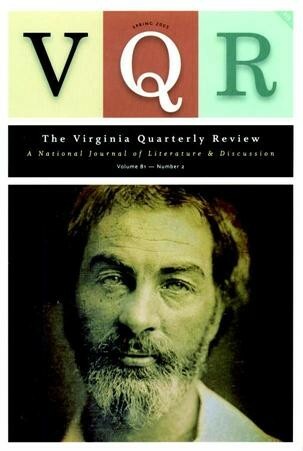 At the University of Virginia, the venerable and, until recently, rather sleepy old quarterly, Virginia Quarterly Review, is having some problems. Its editor, whom almost everyone praises for having revived the journal, seems to be a bad manager and supervisor. There have been complaints to the university from the staff. The editor was turned town for a faculty appointment in the English department. The managing editor, who had suffered from depression, recently committed suicide. The article implies a cause-and-effect connection between and among these factors but--unless we're not being told some crucial fact--it just doesn't add up. Bad relations between a university-affiliated journal and the English department? No news there. A talented editor is bad at running his office? University staff complain about poor management? No news there either. A person suffering from depression takes his own life? Sadly, no news there. So where's the story? I missed any sort of narrative smoking gun here. Presented with this story, as written, the Times editors should have killed the article or asked that the evidence of something newsworthy be made clear. Otherwise, it's commonplace innuendo. As an attentive reader I kept thinking this: Is there something else I need to know to understand this? Is the Times being tasteful in leaving out something salacious? At its worst, the story vaguely implies that the editor drove his managing editor to suicide. But no one quoted in the article comes even close to saying that, so running a fairly major article implying it is, I think, reprehensible as journalism.